The Youth Shelters welcome volunteers who would like to donate their time and share their talents with the residents by leading a group in a number of subjects, such as arts and crafts, gardening, cooking, music, yoga or other therapeutic topics. We are always open to new ideas! Additionally, the shelters are always looking for volunteers to donate meals, decorate for the holidays, or assist with house maintenance and upkeep. Skills and Qualifications. Must be 21 years or older to volunteer directly with the residents. All volunteers are required to undergo background checks and finger printing/Live-scan in addition to completing a health screen/TB test and CPR/First Aid certification. Volunteers are provided further information about all of these requirements after meeting with the Volunteer Coordinator. For those under 21 years old looking to volunteer, there are other volunteer opportunities, such as preparing meals to drop off to the shelter, hosting a drive at your school (to collect hygiene products, sports equipment, art supplies, etc. ), or decorating the shelter for the holidays. Hours and Locations: No minimum weekly or monthly commitment required, flexible scheduling, with availability in the mornings, afternoons, evenings and weekends. 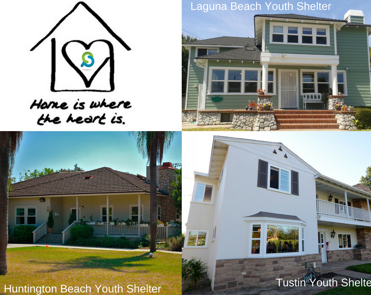 Shelter locations: Laguna Beach, Huntington Beach and Tustin.